School of Visual Arts and Design's Teresa Falcone ’14 and Christopher Sanchez ’14 talk about their experience as animators on the feature film. Teresa Falcone ’14 and Christopher Sanchez ’14 worked as animators on "Smallfoot," which premiered in theaters on Sept. 28. 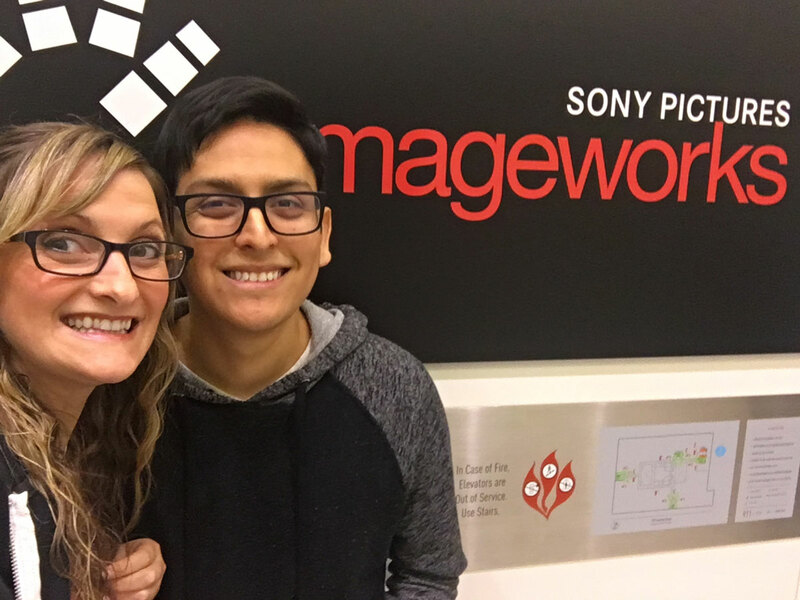 Teresa Falcone ’14 and Christopher Sanchez ’14, alumni from the School of Visual Arts and Design character animation program, have been working on Sony Pictures Imageworks’ new animated film, Smallfoot. The movie premiered Sept. 28 and earned $23 million domestically over opening weekend. Smallfoot is an animated journey for all ages, with a star-studded cast including Channing Tatum, James Corden, Zendaya and LeBron James. The film turns the Bigfoot legend on its head, following a young yeti who encounters a human—a legendary “Smallfoot”—and the duo’s ensuing adventures. Both alumni say they have been fascinated by cartoons, movies, drawing and creating ever since they were young children. Falcone drew and cut out her own paper dolls, loved performing, and for 12 years, performed at Orlando theme parks. Sanchez started his UCF studies as a computer science major. However, he switched majors when he learned about the character animation program. “[Animation] was a combination of everything that I loved growing up and it just felt like the most natural thing for me to do,” Sanchez says. Falcone and Sanchez discuss their experience working as junior animators with Sony, their future projects, and advice they have for current students. How did UCF help get you to where you are today? Teresa Falcone: UCF gave me a really solid foundation for my career. It was great getting to learn different aspects of the pipeline like modeling and texturing as well because those skills have been helpful in getting jobs after school. It’s always helpful as an animator to know what’s going on in the other departments of a shot you’re working on. I’m also really grateful for the experience of working on a team because that’s something that’s really important in a studio and you wouldn’t get that experience at a lot of other places. Studios always like to see that you’re a team player and work well with others and this program definitely prepares you for that. Tell me about working on Smallfoot. TF: I had a great experience working on Smallfoot, and I felt like I really grew as an animator. This was my first time in a junior animator position, so I wasn’t really sure what to expect as far as what kinds of shots I would be cast. I ended up being really happy with the opportunities I was given there and got the chance to step out of my comfort zone with most of my shots. I also made some great friends at Sony, who are all crazy talented animators. Even in the most stressful times, going to work was always a blast. Most importantly I learned that I could actually do it! I always considered myself a really slow animator and was worried I wouldn’t be able to hit deadlines and create decent animation in a certain amount of time. I had such a great lead and supervisor that really helped me improve my animation and speed. It was also a lot of fun listening to all the songs from the movie over and over again as I worked. It was just such a fun movie in general to be a part of. Chris Sanchez: The experience was amazing. I was learning so much from everyone. It felt like animation boot camp. There were very experienced animators there who were always willing to help you out or show you their process if you asked. There were animators from all over the world that worked there, but everyone was extremely passionate about animation and it was inspiring to be in the kind of environment. What was your favorite part about working on the film? CS: Every day I felt inspired. There was never a day where I dreaded going to work. I was constantly challenged and was always determined to overcome those challenges and over time that built up my confidence. Each day I got to collaborate with talented people and work on something that was greater than myself. TF: My favorite part about working on the film was getting to share the experience with fellow UCF grad Chris Sanchez. We could always watch each other’s shots run in dailies and help each other with feedback. TF: I have just started a fix animator position at Pixar where I am currently working on Toy Story 4. I am so excited to be a part of such a legacy movie franchise. CS: After I finished on Smallfoot, I began working on Spider-Man: Into the Spiderverse. And after Spider-Man, I am taking some time off to further my education by taking a class at The Animation Collaborative in the Bay Area. What tips do you have for students interested in animation or students in the program right now? TF: Always keep going if this is what you want to do. Take negative feedback or rejections and turn it into motivation. Don’t be defensive, but instead ask what it is you could be improving on or what you could be missing. Always ask others for feedback and look for opportunities for growth. When you have the opportunity, take more classes. Always be a student wanting to learn more, even when you get a job. Always keep shooting for your plan A.